The US Bank Center was constructed as the home of the First Wisconsin National Bank. In 1969 the company unveiled plans to move from its headquarters at 735 N. Water Street to a new downtown headquarters building at 777 E. Wisconsin Avenue. 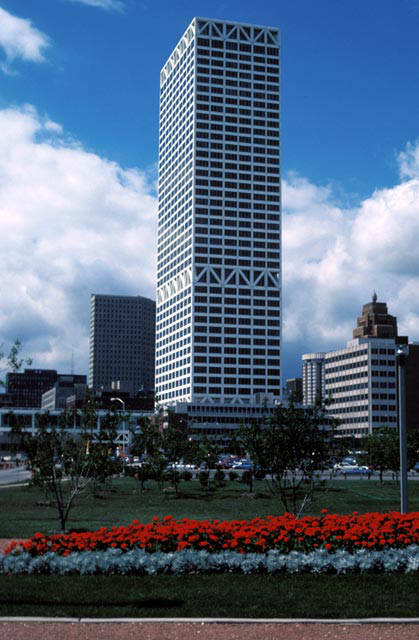 When finished in 1973, the surpassed Milwaukee’s CITY HALL as the tallest in Wisconsin. A sequence of corporate mergers in the late 1980s prompted both the company and the building to change names several times. In 2002, the building assumed its present name, the US Bank Center. Though the bank’s headquarters have moved to Minneapolis, the building remains a potent symbol of Milwaukee’s banking history. A formidable structure, the building rises 42 stories to a height of 601 feet (with another five basement levels) and provides nearly 1,300,000 square feet of retail and office space. The unadorned rectangular structure was built in the international style, primarily with steel and aluminum. The exterior, comprised of over 5,000 windows, is two-thirds glass. Skyways connect the building to the adjacent Lewis Center and Juneau Square North buildings. Collaborating with the local Fitzhugh Scott Architects, the Chicago-based Skidmore, Owings & Merrill LLP Architects headed construction and design. The building was designed by Bruce J. Graham and engineered by Fazlur Khan. Best known for Chicago’s Willis (Sears) Tower and the John Hancock Building, Graham and Khan were pioneers of the trussed-tube architectural style. This style, combined with the building’s height, makes the US Bank Center distinctive in Milwaukee’s skyline. Bands of diagonal trusses, approximately 1/3 of the way from the bottom, and along the top are both structurally and aesthetically functional. Construction began in 1971 and took two years to complete. Two workers were killed and several others injured in a series of construction accidents. In 1988, First Wisconsin changed its name to Firstar Corporation; and in 1999 they installed four large Firstar signs around the top of the building. Many Milwaukeeans criticized the enormous green signs for damaging the building’s aesthetic integrity and turning it into a corporate billboard. Bank spokespeople defended the decision, however, as an effort to reinforce identification with the relatively new Firstar brand. Despite the critics, the signs remained; they were replaced in 2002 with signs advertising the building’s new owner, US Bank. The building’s managers have endeavored to make it a community- and environmentally-friendly space. The building periodically opens for charity events and is implementing energy-efficient and waste-reducing methods of operating. In 1987 the building dedicated a section of its roof as a nesting ground to help rehabilitate Wisconsin’s Peregrine Falcon population. The program continued beyond its original 5-year plan; by 2011, 66 peregrines had hatched atop the building. ^ Milwaukee Historic Preservation Committee, Permanent Historic Designation Study Report: First National Bank/First Wisconsin National Bank Building, 733-743 N. Water Street (Milwaukee: City of Milwaukee, June 2007), accessed December 9, 2013. ^ “Unreal Scene Now Means First Wisconsin Center Later,” The Milwaukee Sentinel, August 28, 1971, accessed February 12, 2014, http://news.google.com/newspapers?nid=1368&dat=19710828&id=FKVRAAAAIBAJ&sjid=_xAEAAAAIBAJ&pg=7227,6703529; Scott Jacobs, “Renaissance – Is It Just One More Study Away?” The Milwaukee Sentinel, September 11, 1971, accessed February 12, 2014, http://news.google.com/newspapers?nid=1368&dat=19710911&id=KXZQAAAAIBAJ&sjid=xhAEAAAAIBAJ&pg=5051,1993483; William J. Manly, “Bank Center to Be 42 Stories,” The Milwaukee Journal, March 18, 1971, accessed February 12, 2014, http://news.google.com/newspapers?id=RVoaAAAAIBAJ&sjid=cigEAAAAIBAJ&dq=first-wisconsin-center&pg=3786%2C4043675. ^ Ed Pahule, “Wisconsin’s Tallest Building for 80 Years,” Examiner, March 11, 2013, http://www.examiner.com/article/wisconsin-s-tallest-building-for-80-years, accessed December 10, 2013. ^ Milwaukee Historic Preservation Committee, Permanent Historic Designation Study Report; “Firstar Timeline: Long Road to Minneapolis,” JSOnline, accessed December 11, 2013, http://www3.jsonline.com/bym/news/oct00/firstartimeline100500.asp. ^ “About Us,” US Bank Center Milwaukee, accessed March 31, 2016; “US Bank Center,” The Skyscraper Center, http://www.skyscrapercenter.com/milwaukee/u.s.-bank-center/, accessed December 11, 2013, now available at http://www.skyscrapercenter.com/building/us-bank-center/2189. ^ “US Bank Center,” Emporis, accessed December 10, 2013; Damien Jaques, “Bank Center a City Set Down on 6 Acres,” The Milwaukee Journal, October 2, 1973, accessed December 10, 2013, http://news.google.com/newspapers?id=LNsjAAAAIBAJ&sjid=2igEAAAAIBAJ&dq=first-wisconsin-center&pg=7122%2C519724. ^ “US Bank Center,” Emporis. ^ Mary Louise Schumacher, “Two Men Who Influenced Milwaukee’s Skyline,” JSOnline, March 17, 2010, accessed December, 12, 2013. ^ Yasmin Sabina Kahn, Engineering Architecture: The Vision of Fazlur R. Kahn (New York: WW Norton & Co., 2004), 183. ^ “Unreal Scene Now Means First Wisconsin Center Later,” The Milwaukee Sentinel, August 28, 1971, accessed February 12, 2014, http://news.google.com/newspapers?nid=1368&dat=19710828&id=FKVRAAAAIBAJ&sjid=_xAEAAAAIBAJ&pg=7227,6703529; Scott Jacobs, “Renaissance—Is It Just One More Study Away?” The Milwaukee Sentinel, September 11, 1971, accessed February 12, 2014, http://news.google.com/newspapers?nid=1368&dat=19710911&id=KXZQAAAAIBAJ&sjid=xhAEAAAAIBAJ&pg=5051,1993483; William J. Manly, “Bank Center To Be 42 Stories,” The Milwaukee Journal, March 18, 1971, accessed February 12, 2014, http://news.google.com/newspapers?id=RVoaAAAAIBAJ&sjid=cigEAAAAIBAJ&dq=first-wisconsin-center&pg=3786%2C4043675. ^ “One Killed, 7 Hurt at Skyscraper,” The Milwaukee Sentinel, July 3, 1973, accessed December 10, 2013, http://news.google.com/newspapers?id=58QVAAAAIBAJ&sjid=XhEEAAAAIBAJ&pg=4892%2C259790. ^ Whitney Gould, “Corporate Schlock Ruins 2 Modernist Landmarks,” Milwaukee Journal Sentinel, July 5, 1999, accessed December 10, 2013, http://news.google.com/newspapers?id=gKcaAAAAIBAJ&sjid=SC8EAAAAIBAJ&dq=corporate-schlock-ruins-2-modernist-landmarks&pg=2349%2C6619291. ^ Whitney Gould, “Bank’s New Sign Is Little Improvement,” Milwaukee Journal Sentinel, March 12, 2001, accessed December 10, 2013, http://news.google.com/newspapers?id=tqcaAAAAIBAJ&sjid=WjAEAAAAIBAJ&dq=firstar-center%20sign%20milwaukee&pg=1953%2C2011697. ^ US Bank Center Milwaukee, “Environmental,” accessed December 9, 2013. ^ US Bank Center Milwaukee, “Environmental”; “Peregrine Falcon Egg Hatches,” The Milwaukee Sentinel, June 13, 1989, accessed December 9, 2013, http://news.google.com/newspapers/p/milwaukee_journal?id=c3YxAAAAIBAJ&sjid=phIEAAAAIBAJ&pg=7066,3677831&dq=first+wisconsin+center&hl=en. Anticipating the climb up Wisconsin’s tallest building. The StairMaster did not prepare me for this! My legs feel like they’re made of lead, my lungs are burning, and my heart is pounding harder than I knew it could. “12 more floors,” I manage to wheeze in the general vicinity of a friend I somehow convinced to partake in the American Lung Association’s Fight for Air stair climb at the U.S. Bank Center. And so we found ourselves, on a Saturday morning and of our own free will, having run up 35 floors of the U.S. Bank Center, with 12 torturous flights to go. When we staggered to the top a few minutes later we were greeted with a medal, a water bottle, and the best view of Milwaukee either of us had ever seen. We took our time making a slow lap around the observation deck, pointing out where we grew up, where we lived now, and various city landmarks. We stood for a while, just wiping away the windows’ condensation and soaking in the enormity of Lake Michigan from 601 feet above the ground. When the next wave of climbers started to arrive, we crowded into an elevator with a team of local firefighters (who completed the climb in full gear and seemed ready to do it again) and rode, gratefully, down to the lobby. My trip to the top of the U.S. Bank Center began several months earlier when I was assigned to write an entry about the building for the Encyclopedia of Milwaukee. Over the course of my research I came across several newspaper articles that mentioned the building’s observation deck. I immediately wanted to see it for myself, so I called the number listed on the building’s official website and asked how I could make that happen. “Unfortunately,” the woman on the other end of the line told me, “the observation deck is no longer open to the public.” I asked a few more questions and found out that it does open twice a year—once for Doors Open Milwaukee, for which I was several months too late, and once for the annual stair climb, for which I had several months to prepare. I signed up for the stair climb shortly thereafter. It may seem a little absurd to willingly climb 1,000+ stairs (indeed, to pay someone to let you do it) just to gain access to a building, but I was fixated. I split my time at the Encyclopedia between entry writing and image research. Most of the entries I’m assigned are notable buildings around the city. I typically experience a period of deep infatuation with each one over the course of my research. I grow attached to the building; it becomes my favorite in the city; I go out of my way to drive by it on my way home from work. Even though I grew up in Milwaukee, I find myself looking at them as though I’ve never seen them before. For me, the stair climb was a way to see the inner workings of a building I had spent several months researching—I could not turn the opportunity down. Given the chance, I would gladly do the same for every building I’ve researched. As a Milwaukee resident, I’ve spent my whole life seeing these buildings from the street or understanding them only as an abstract part of the Milwaukee skyline. Being allowed inside, to really feel how tall they are and see their architectural styles up close, is something I never knew I was so interested in before working for the Encyclopedia. My original plan had been to take some photos from the observation deck that could be of potential use for the image research side of my responsibilities. Unfortunately that didn’t pan out. The heat generated by all the sweaty climbers covered the windows in far too much condensation to get any decent aerial shots. Aside from that, those oh-so-controversial signs along the building’s top obstructed much of the view. Having heard so many opinions about these signs over the course of my life (I had a classmate whose mother once wrote the building managers a letter of disapproval, she felt so strongly), it was interesting to find myself standing right behind them now. This is not, by any means, the usual course my research takes, but I’m glad it did this time. So much of historical research and writing involves whiling away the hours sitting in an archive or at a desk that the climb was a nice change of pace and environment. For me, it’s a prime example of how history is not a static, isolated field of study. It is something the surrounds and involves us. In this particular instance, studying history literally made my heart race. I’ve always understood history as the study of shared experience, and this event made me feel more connected to those around me than any other type of research method I’ve tried yet. I was already finished writing my entry by the time the stair climb came around, so I didn’t learn much from the event that was of use to me there. But it did give me a new perspective of the city and make me feel like a part of it. Perhaps most importantly, it fostered a sense of pride and connection to the Milwaukee community, which is exactly why I was so attracted to the Encyclopedia in the first place. ^ The race starts in the basement, so participants run up more than the buildings 42 above-ground stories. This climb occurred on March 22, 2014.